Background and Objectives: The vicissitudes and stresses of medical education in India have been suggested to be different from that of the Western world. Several studies have attempted to assess the psychological morbidity among medical students in India. This systematic review attempted to collate the findings relating to the prevalence of depression, anxiety, and stress among medical students in India. Materials and Methods: Studies were identified using PubMed, Embase, MedInd, and Google Scholar databases. Those studies conducted in India which reported the prevalence of depression, anxiety, and stress among the medical students were included. Pooled prevalence rate was calculated for depression, anxiety, and stress. Results: The prevalence rate of depression varied from 8.7% to 71.3%, while the pooled prevalence rate of depression from 16 studies (n = 3882) was 39.2% (95% confidence interval: 29.0%–49.5%). Similarly, the pooled prevalence rate of anxiety from four studies (n = 686) was 34.5% (95% confidence interval: 10.1%–58.9%), and the pooled prevalence rate of stress from 28 studies (n = 5354) was 51.3% (95% confidence intervals: 42.8%–59.8%). Female students had higher rates of depression and stress as compared to males. Conclusions: Depression, anxiety, and stress affect a considerable proportion of undergraduate medical students in India. Systemic efforts are needed to address their concerns and make mental health care easily accessible to them. Graduate medical studies are considered one of the most stressful professional courses., High expectations from self and family members, coupled with the training for assuming responsibility for the well-being of the patient, make a medical student prone to experience stress which may become excessive. In addition, medical students need to devote time for their academic pursuits and are often not able to spare reasonable time for hobbies and relaxing pursuits. The accumulating stress is likely to have several deleterious effects on medical students including academic jeopardy and poor quality of life. Thus, high rates of depression, anxiety, and stress can result in poor quality of life and high rates of psychological morbidity. Psychological symptoms of anxiety, depression, and stress among medical students have been reported from across the globe.,,,,, Systematic reviews have been conducted upon studies reporting anxiety and depression among medical students from different parts of the world.,, Indian medical education system has some unique features which make it different from other regions. First, the selection process of medical students is contingent upon scores and rank on an entirely written multiple choice questions-based entrance examination, whereas in the Western countries, a personal statement, interviews, and extracurricular records are also given due weightage for the assessment of candidates, besides other things such as voluntary service and research. Second, family influences play an important role in the decision of the student to pursue a career in medicine. This is different from the “Western” world where the students exercise explicit autonomy in deciding their careers. Third, the selection into lucrative residencies is based on the academic performance in single entrance examination after the medical graduate course. This leads to continued pressure of securing a good position and emphasis only on academic performance to get a residency of choice. Given the differences in considerations of medical education, it becomes imperative to consolidate the evidence pertaining to depression, anxiety, and stress in the Indian context. Till date, there is no systematic review assessing these psychological issues focusing upon Indian medical students. Hence, this systematic review aimed to assess depression, anxiety, and stress among medical students from India. The primary objective was to assess the prevalence of anxiety, depression, and stress among medical students in Indian medical colleges. The secondary objective was to assess the relationship of anxiety, depression, and stress among medical students with gender. 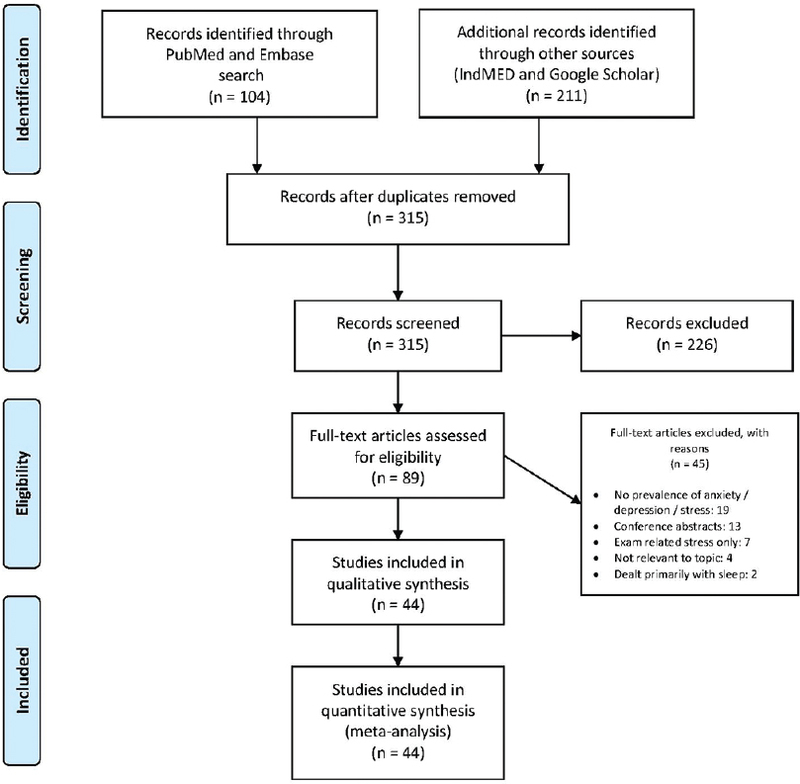 The present review used electronic searches with PubMed, Embase, and MedInd databases supplemented with Google Scholar search. All studies published from January 1970 to October 2015 were reviewed. The search expression used for PubMed was ([Medical students] OR [Medical undergraduates] OR [MBBS students]) AND (depress* OR anxiety OR stress*) AND [India OR Indian]. Other synonymous expressions were also utilized to conduct the literature search in Google Scholar. Further studies were identified from the bibliographies of the studies screened during the literature review. Searches were carried out in the months of November and December 2015 by SS and RG. Title/abstract screening was done by SS and RG, and articles were selected with mutual consensus. The present study primarily relied on electronic searches and hand searches were not carried out as a part of this review. Studies were included if they had reported the prevalence rate of anxiety, depression, or stress and were published in peer-reviewed English-language journals. Studies which had reported the proportion of students who had aforementioned psychological morbidity were included, but those studies which had only reported the mean and/or standard deviation of anxiety, depression, or stress scores were not included. Studies conducted in heterogeneous group of students from different courses were included if they had reported psychological morbidity in medical students separately. Conference abstracts were not included in the present systematic review. Those studies which reported other psychological attributes such as sleep, quality of life, and personality parameters without reporting the prevalence of depression, anxiety, or stress were excluded. Older studies which were only in print issue and not accessible online were also not included. The studies which fulfilled the inclusion and exclusion criteria were assessed in detail. Information that was extracted from the records included author and year of the study, the study location, sample size and sampling method, the method/definition of depression, anxiety, or stress, and the prevalence rate. In case the study reported several variables of interest, then prevalence rate according to all the assessment methods was recorded. Data extraction was done by RG and SS. Clarifications and doubts if any were sorted out by mutual discussion. The prevalence rate of depression according to each of the studies was extracted from the published papers. Pooled prevalence rate was computed for depression, anxiety, and stress using the random effects model. Computation of pooled prevalence rates and 95% confidence intervals was done using Excel chart application. Pooled analysis was conducted for psychological attributes which had at least three relevant studies. Random effects model was used given the heterogeneity in the methods of assessment and the prevalence rates reported. The I2 test of heterogeneity was used to assess the heterogeneity of reported prevalence rates, with higher values reflecting greater degree of heterogeneity. Wherever available, the odds ratio of anxiety, depression, and stress among males and females was computed. The pooled odds ratio of depression and stress among male and female medical students was computed along with the 95% confidence intervals. Sensitivity analysis or meta-regression analysis was not conducted as a part of this review. We also did not attempt a qualitative analysis of the studies. A total of 44 studies were included in the review [Figure 1]. Among them, 16 studies reported prevalence rates of depression, 4 reported prevalence rates of anxiety, and 2 did not distinguish between anxiety and depression. 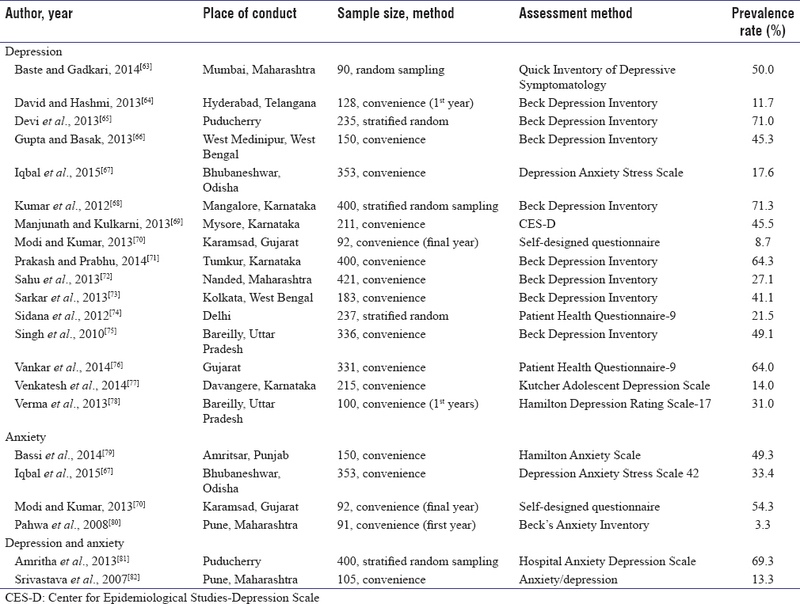 A total of 16 studies were identified which reported depression in medical students in India [Table 1]. 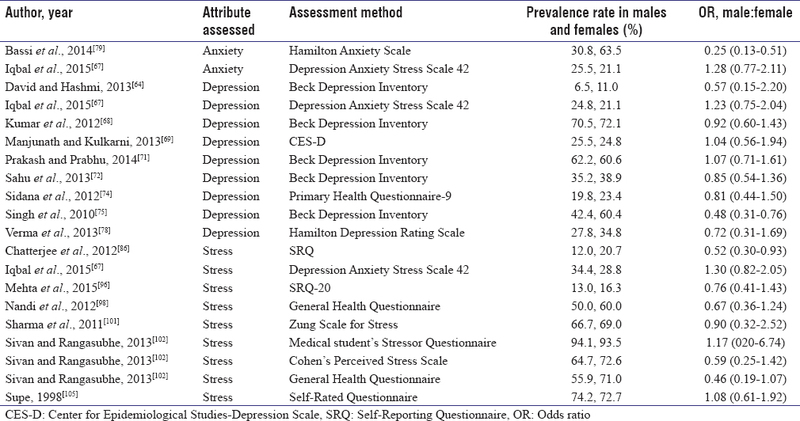 The most common instrument used was Beck Depression Inventory, followed by other rating scales including Primary Health Questionnaire-9, Depression Anxiety Stress Scale, Quick Inventory of Depressive Symptomatology, Center for Epidemiological studies-Depression scale, Hamilton Depression Rating Scale, and Kutcher Adolescent Depression Scale. The sample sizes of the studies varied from 90 to 421. The prevalence rate of depression varied from 8.7% to 71.3%. The pooled prevalence rate of depression for the sample (n = 3882) was 39.2% (95% confidence interval: 29.0%–49.5%) using random effects model. The I2 test of heterogeneity value was 5.3. 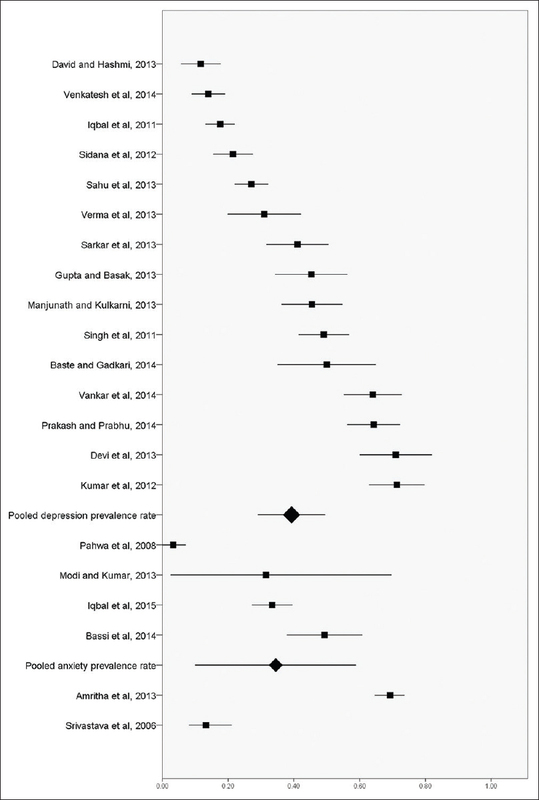 The forest plot of the studies included in the review reporting findings on anxiety and depression is shown in [Figure 2]. Four studies evaluated anxiety symptoms among students, while two of them looked at anxiety and depression together. The instruments utilized included Hamilton Anxiety Scale, Depression Anxiety Stress Scale, Beck's Anxiety Inventory, Hospital Anxiety Depression Scale, and in-house-developed instruments. The rates varied from 3.3% to 54.3% for anxiety, while they ranged from 13.3% to 93.8% for symptoms of anxiety and depression taken together. For anxiety, the pooled prevalence rate of the sample (n = 686) was 34.5% (95% confidence interval: 10.1% to 58.9%) using random effects model, and the I2 value was 0. [Table 2] depicts the studies which had reported the rates of psychological stress or distress. A variety of instruments had been utilized to assess stress. While many of the studies used self-rated questionnaires, others have used structured questionnaires such as the General Health Questionnaire, Depression Anxiety Stress Scale, Professional Life Stress proforma, Presumptive Life Stress Questionnaire, Stress Management Questionnaire, Psychological General Well-Being scale, Zung Scale for Stress, Perceived Stress Scale, and others. The sample size varied from 36 to 493, and the prevalence varied from 5.0% to 96.8%. The pooled prevalence rate of the sample (n = 5354) was 51.3% (95% confidence interval: 42.8%–59.8%) based on random effects model. The I2 test of heterogeneity value was 34.6. The forest plot of the studies included in the review reporting findings on stress is shown in [Figure 3]. The gender differences in the rates of anxiety, depression, and stress are depicted in [Table 3]. There was heterogeneity in the gender predominance of symptoms of anxiety, depression, and stress. On pooled analysis, males were less likely than females to have depression (odds ratio of 0.85, 95% confidence interval: 0.73–0.96) and stress (odds ratio: 0.90, 95% confidence interval: 0.81–0.99). This systematic review suggests that depression affects roughly two-fifths of the medical undergraduate students, while stress affects more than half of the students of medical courses, though there was a marked variation in the reported rates of depression and stress across the studies. Female students were more likely to be affected by depression and stress as compared to male students. 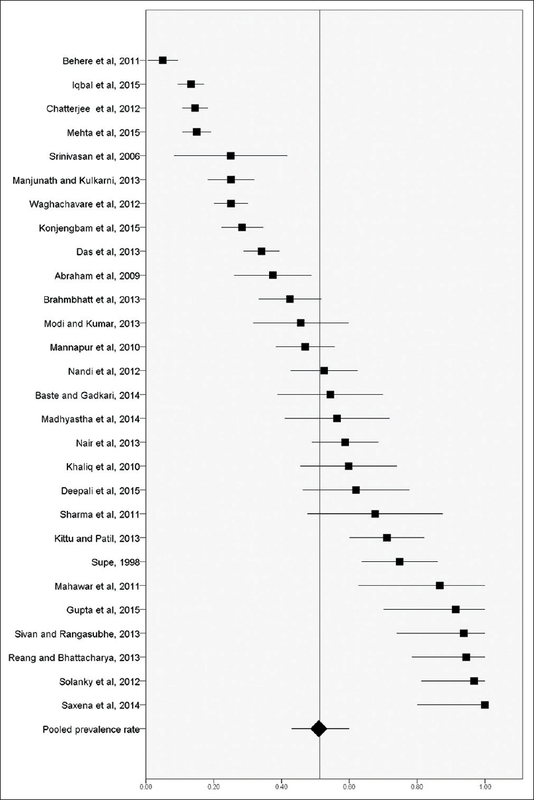 The reported rates of depression in the present review among Indian studies varied from 8.7% to 71.3%. Even with Beck Depression Inventory, the most commonly used instrument used for assessment of depression in the Indian studies, the rates of depression ranged from 11.7% to 71.3%. The cutoff chosen for an individual to be classified as depressed would also make a difference to the rates of depression, though typically a cutoff of 10 and above is used for Beck Depression Inventory. Studies from other parts of the world have also found a wide range of prevalence of depression among medical students, though a substantial proportion of medical students have been reported to be affected., Though a fewer number of studies addressed anxiety, it seems that about a third of the medical students are affected by prominent anxiety symptoms. The present review suggests that more than half of the students suffered from considerable stress. Stress can be conceptualized in various ways, and diversity exists in the manner in which stress has been operationalized. Some amount of stress is adaptive and helps to trigger the hormonal response needed to counter situations that are challenging emotionally and physiologically. However, the aim of this review was to find pathological stress or distress, which may have adverse outcomes in general. The individual studies included in the review were heterogeneous in their definition of stress, and the reported prevalence rates varied from 5.0% to even 100%. Comparison of male and female students suggested that female students were more likely to suffer from depression and stress, as compared to male students. This is in line with previous literature which suggests that female medical students have higher rates of symptoms of depression, anxiety, and stress.,, The findings can also be contextualized with literature among the general population, which suggest that women are more likely to suffer from depression and anxiety than men. Men, on the other hand, are likely to suffer from substance-use disorders, which, however, was not analyzed in the present systematic review. The high rates of depression, anxiety, and stress noted in this review are worrisome. This reflects that the medical students are likely to experience considerable degree of psychological morbidity. Students are likely to be primed for the medical course being a tough one at the time of preparation for the entrance examination. Yet, many of them are not able to cope effectively with the stress that the medical school training entails. The genesis of anxiety, depression, and stress among medical students may be multifactorial. The inability to cope with the vast curriculum; repeated examinations; high expectations of the parents, teachers, and patients, and time constraints for pursuing their alternate interests may be contributory., Depression, anxiety, and stress among medical students are often underrecognized and undertreated. Stigma surrounding mental health issues often deters medical students from seeking professional help. Hence, medical students do not seek formalized care for psychological distress, despite such a facility being available at close quarters. In addition, it is possible that medical students may feel that developing resilience is a part of becoming a doctor and hence distress would need to be endured as a part of the training. The issue that arises is what can be done for the medical students who experience psychological distress. Several approaches and strategies can be utilized that can extend timely help to the students. First, students who join the undergraduate medical course can be made aware about the early symptoms of anxiety and distress, and can be told where to seek help in the hospital premises. Often, the fresh medical students are uninitiated about the process and access options of mental and physical health care. Hence, giving due information may empower them to seek help in an appropriate manner, rather than seeking informal advice from seniors and peers. Second, the mental health-care services can be made more accessible to students. This may involve approaches such as having a dedicated psychological help clinic in the campus or having alternate means of communication through a helpline or E-mail. Third, peer mentorship programs can help students relate to seniors and share their concerns with them. Peer mentorships may help to detect problems early and bring them under the care umbrella sooner. Fourth, informal channels of consultation by psychiatrists and clinical psychologists may be considered, especially for cases where the student is not clear whether the distress requires clinical attention or not. A brief assessment would help to clarify whether the student would need clinical attention and treatment in the form of psychotherapy and/or medications. Fifth, health promotion and resilience-enhancing measures may be considered. Life skills' counseling that emphasizes on effective methods of dealing with stress might be helpful in making the students more adept at dealing with stressors. The above-discussed means and methods are not mutually exclusive, and one or more of the above can be implemented based on providers' and users' expressed priorities. Much of the literature included in the review originated from the states of Karnataka, West Bengal, and Gujarat. The largest number of studies from Karnataka is in line with the highest number of medical colleges in this state. It is heartening to know the interest of the researchers in understanding the extent of psychological distress among the medical students in the region. However, mental health researchers and medical education facilitators from other parts of India also need to be cognizant of the issues relating to psychological distress, anxiety, and depression among medical students. Comparative and collaborative research involving different medical schools and using standardized instruments may help to give a more accurate picture of medical students' psychological morbidity. The findings of this review need to be considered in view of some strengths and limitations. The strengths include being the first review of this kind from India and using pooled analysis to derive the extent of depression, anxiety, and stress among the student population. The limitations include focus on limited aspects of psychological morbidity (i.e., prevalence rate and male:female ratio) and exclusion of other psychological attributes such as examination stress, sleep problems, and substance-use disorders. The review did not attempt sensitivity analysis neither did it attempt at discerning prevalence rates according to the region of origin or semester of the study. Risk of publication bias and risk of bias for individual studies could also not be assessed. The study has generalizability to the Indian context, and caution needs to be exercised while extrapolating the findings to other South Asian countries and other parts of the world. The present review may be considered as a launching pad for future research designs with better methodology from India on the topic of psychological morbidity in medical students. These have been summarized in [Box 1]. First, there is a need to conduct multicentric studies with the same methodology and using comparable representative samples to assess whether the differences in rates of depression and stress are artifactual or are indeed present. Second, longitudinal studies of medical students assessing depression, anxiety, and stress of various time points may help in clarifying the stability of the symptoms of psychological distress and remark on whether distress subsides when the students get respite from coursework during vacations. Such studies would also clarify whether psychological distress increases or decreases with time. Third, reporting of studies would improve if the methodology is described in detail and ethical approval is specified clearly. Fourth, the assessment of psychological morbidity may be coupled with the evaluation of needs of treatment, i.e., what forms of treatment would the students prefer and what barriers they perceive in seeking treatment. Fifth, the assessment of psychological morbidity may be paired with other external validators such as quality of life and academic performance. This would give a greater impetus toward addressing the concerns of the students. Sixth, data from intervention trials in this population need to be consolidated. Not only efficacy and adverse effects, but also acceptability and issues in delivery are needed to be highlighted (e.g., for psychotherapy). The review suggests that a substantial proportion of medical students suffer from depression, anxiety, and psychological distress. Efforts are required to cater to medical students who are distressed, in a nonintrusive manner. Awareness about manifestations of distress among medical students needs to be increased among not only students themselves, but also other stakeholders such as medical educationists and parents. Further research is required on this issue, and multicentric longitudinal studies would help to provide better answers about psychological distress among medical students in India. Guthrie EA, Black D, Shaw CM, Hamilton J, Creed FH, Tomenson B, et al. Embarking upon a medical career: Psychological morbidity in first year medical students. Med Educ 1995;29:337-41. Radcliffe C, Lester H. Perceived stress during undergraduate medical training: A qualitative study. Med Educ 2003;37:32-8. Sood R. Medical education in India. Med Teach 2008;30:585-91. Dyrbye LN, Thomas MR, Shanafelt TD. Medical student distress: Causes, consequences, and proposed solutions. Mayo Clin Proc 2005;80:1613-22. Paro HB, Morales NM, Silva CH, Rezende CH, Pinto RM, Morales RR, et al. Health-related quality of life of medical students. Med Educ 2010;44:227-35. Schwenk TL, Davis L, Wimsatt LA. Depression, stigma, and suicidal ideation in medical students. JAMA 2010;304:1181-90. Aktekin M, Karaman T, Senol YY, Erdem S, Erengin H, Akaydin M, et al. Anxiety, depression and stressful life events among medical students: A prospective study in Antalya, Turkey. Med Educ 2001;35:12-7. Dahlin M, Joneborg N, Runeson B. Stress and depression among medical students: A cross-sectional study. Med Educ 2005;39:594-604. Tomoda A, Mori K, Kimura M, Takahashi T, Kitamura T. One-year prevalence and incidence of depression among first-year university students in japan: A preliminary study. Psychiatry Clin Neurosci 2000;54:583-8. Aniebue PN, Onyema GO. Prevalence of depressive symptoms among Nigerian medical undergraduates. Trop Doct 2008;38:157-8. Baldassin S, Alves TC, de Andrade AG, Nogueira Martins LA. The characteristics of depressive symptoms in medical students during medical education and training: A cross-sectional study. BMC Med Educ 2008;8:60. Dyrbye LN, Thomas MR, Shanafelt TD. Systematic review of depression, anxiety, and other indicators of psychological distress among U.S. And Canadian medical students. Acad Med 2006;81:354-73. Salam A, Yousuf R, Bakar SM, Haque M. Stress among medical students in Malaysia: A systematic review of literatures. Int Med J 2013;20:649-55. Hope V, Henderson M. Medical student depression, anxiety and distress outside North America: A systematic review. Med Educ 2014;48:963-79. Jayakrishnan T, Honhar M, Jolly GP, Abraham J, T J. Medical education in India: Time to make some changes. Natl Med J India 2012;25:164-7. Pruthi S, Pandey R, Singh S, Aggarwal A, Ramavat A, Goel A, et al. Why does an undergraduate student choose medicine as a career. Natl Med J India 2013;26:147-9. Neyeloff JL, Fuchs SC, Moreira LB. Meta-analyses and forest plots using a Microsoft excel spreadsheet: Step-by-step guide focusing on descriptive data analysis. BMC Res Notes 2012;5:52. Ali RV, Vankar GK. Psychoactive substance use among medical students. Indian J Psychiatry 1994;36:138-40. Chakraborti A, Ray P, Sanyal D, Thakurta RG, Bhattacharayya AK, Mallick AK, et al. Assessing perceived stress in medical personnel: In search of an appropriate scale for the Bengali population. Indian J Psychol Med 2013;35:29-33. Cherkil S, Gardens SJ, Soman DK. Coping styles and its association with sources of stress in undergraduate medical students. Indian J Psychol Med 2013;35:389-93. Jena SK, Misra AK, Mohanty A, Acharya M. Assessment of stress and correlation with EEG in medical students. Res J Pharm Biol Chem Sci 2014;5:1345-55. Joseph N, Joseph N, Panicker V, Nelliyanil M, Jindal A, Viveki R, et al. Assessment and determinants of emotional intelligence and perceived stress among students of a medical college in South India. 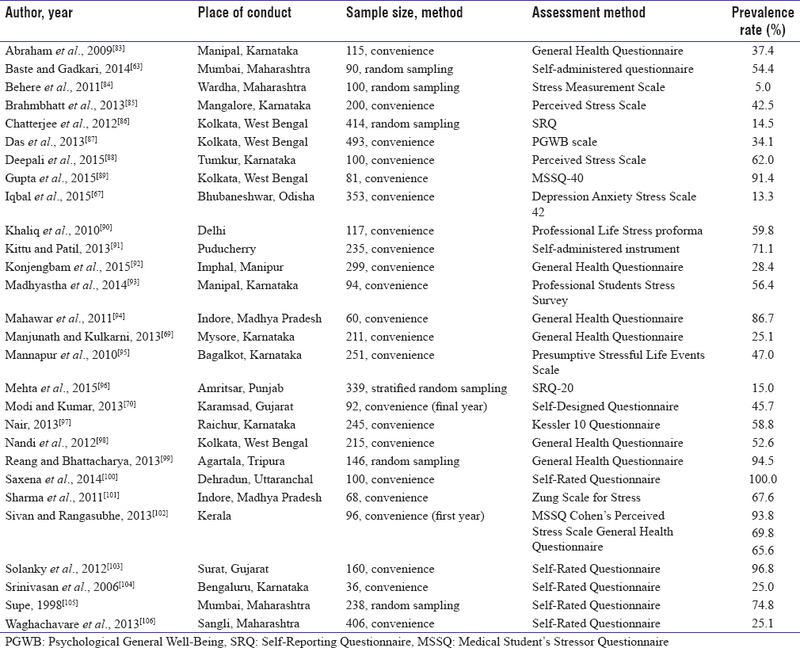 Indian J Public Health 2015;59:310-3. Kumar M, Sharma S, Gupta S, Vaish S, Misra R. Medical Education Effect of stress on academic performance in medical students – A cross sectional study. Indian J Physiol Pharmacol 2014;58:81-6. Kumar M, Venkatesh D, Joshi M, Manjunath H, Sharma R. Study of stressors and coping techniques in first year medical students. Biomedicine 2008;28:108-11. Malathi A, Damodaran A. Stress due to exams in medical students – Role of yoga. Indian J Physiol Pharmacol 1999;43:218-24. Mane Abhay B, Krishnakumar MK, Niranjan Paul C, Hiremath Shashidhar G. Differences in perceived stress and its correlates among students in professional courses. J Clin Diagn Res 2012;5:1228-33. Pai DR, Ram S, Madan SS, Soe HH, Barua A. Causes of stress and their change with repeated sessions as perceived by undergraduate medical students during high-fidelity trauma simulation. Natl Med J India 2014;27:192-7. Gupta S, Ray TG, Saha I. Overweight, obesity and influence of stress on body weight among undergraduate medical students. Indian J Community Med 2009;34:255-7. Patil U, Ruikar V, Vaidya S, Shinde S, Divekar S, Kittad S. Effects of pranayama and aerobic exercise on anxiety status of medical students. Int J Recent Trends Sci Technol 2014;11:214-7. Ranade AR, Dhanumali SR. Stress among first MBBS students of Shri Bhausaheb Hire Government Medical College, Dhule. Int J Pharma Bio Sci 2015;6:B1061-5. Salgar ST. Stress in first year medical students. Int J Biomed Adv Res 2014;5:79-80. Shah C, Trivedi RS, Diwan J, Dixit R, Anand AK. Common stressors and coping of stress by medical students. J Clin Diagn Res 2009;3:1621-6. Singh J, Basu C. A study of anxiety components and related problem areas among medical students. Indian J Clin Psychol 1982;9:177-82. Srikanth S, Latha R, Roja ED, Sairaman H, Janani B, Susiganeshkumar E, et al. Effect of music on stress and academic performance of undergraduate medical students. Natl Med J India 2014;27:351-2. Velayudhan A, Gayatridevi S, Bhattacharjee RR. Efficacy of behavioral intervention in reducing anxiety and depression among medical students. Ind Psychiatry J 2010;19:41-6. Kumar H, Malipatil V, Supriya H. A study on depression and its determinants among undergraduate medical students from coastal South India. Indian J Public Health 2015;5:188-92. Budihalmath J, Handlgol A, Hegde G. Level of depression in newly inducted medical students. Indian J Psychiatry 2009;51:S123. Elangovan S, Thurairajasingam S, Ahin C, Selvadurai J. Psychological well-being among medical student in clinical years. Indian J Psychiatry 2015;57:S12-3. Gupta N, Agarwal J, Singh H. Role of depression in waning academic performance of medical students. Indian J Physiol Pharmacol 2011;55:248-9. Jose A, Kumar S, Subin S, Swathi V, Syamlal A, Chandran T. Prevalence of stress among students of a medical college in Central Kerala. Nepal J Epidemiol 2014;4:9. Lohitashwa R, Kadli N, Kisan R. Effect of stress on sleep quality in young adult medical students: A cross sectional study. Int J 2015;3:3519-23. Kamath R, Shah H, Sharma S. Assessment of self esteem, perceived stress, phobias and their correlates amongst undergraduate medical and paramedical students in a tertiary medical hospital. Indian J Psychiat 2010;52:S54. Raut P, Wadikar S. Comparative analysis of the depression, stress, and anxiety levels in non obese, obese and overweight medical students. Indian J Physiol Pharmacol 2013;57:195. Sharma M, Nanjegowda R. A comparative study of stress and self-efficacy among medical and non-medical students. Australas Med 2012;5:73-4. Talikoti S, Aithala M, Patil S. A study of stress in medical students. Indian J Physiol Pharmacol 2013;57:251-2. Upadhyaya S. Prevalence and associated risk factors of social anxiety in medical students. Indian J Psychiatry 2015;57:S119. Vispute C, Kadam K, Parkar S. Perception of stress and coping strategies amongst 1st year medical undergraduates. Indian J Psychiatry 2011;53:S90. Verma S. Prevalence of depression among 1st year medical students and it's reflection on their academic performance. Indian J Physiol Pharmacol 2011;55S: 250-1. Yashwanth A, Srirama, Reddy M. Assessment of stress among medical students using MMSQ in a rural medical college. Indian J Psychiatry 2013;55:S107-8. Gajalakshmi G, Kavitha U, Anandarajan B, Chandrasekar M. A study to analyze various factors contributing to stress in first year MBBS students during examination. Int J Biomed Adv Res 2012;3:700-3. Kharche JS, Pranita A, Phadke AV, Joshi AR. Evaluation of examination stress in I MBBS medical students. Natl J Integr Res Med 2012;3:27-31. Kodavanji B, Kumar AN, Noojibail A, Bhat R, Pai S. Gender difference in examination stress on physical and hematological parameters in medical students. Indian J Physiol Pharmacol 2013;57S: S108-9. Kudachi PS, Latti RG, Goudar SS. Effect of examination stress on the academic performance of first year medical students. Biomedicine 2008;28:142-4. Malathi A, Parulkar VG. Evaluation of anxiety status in medical students prior to examination stress. Indian J Physiol Pharmacol 1992;36:121-2. Pradhan G, Mendinca NL, Kar M. Evaluation of examination stress and its effect on cognitive function among first year medical students. J Clin Diagn Res 2014;8:BC05-7. Shukla N, Verma NS, Tandon SN, Khanna DN, Tewari S, Pandey US, et al. Examination stress in medical student: A study. Indian J Med Sci 1993;47:264-6. Jhambh I, Arun P, Garg J. Cross-sectional study of self-reported ADHD symptoms and psychological comorbidity among college students in Chandigarh, India. Ind Psychiatry J 2014;23:111-6. Kumaraswamy N, Ebigbo PO. Stress among second year medical students: A comparative study. Indian J Clin Psychol 1989;16:21-3. Latha R, Kantha S. Effect of gender and hostel life on stress and performance in medical students. Biomedicine 2006;26:6-12. Naushad S, Farooqui W, Sharma S, Rani M, Singh R, Verma S, et al. Study of proportion and determinants of depression among college students in Mangalore city. Niger Med J 2014;55:156-60. Chandrashekar TR, Rajashekar RK, Kanthi AG, Katte R, Shantha AR, Hungund BR, et al. Study of sleep hygiene in relation with quality of life among medical students. Indian J Public Health Res Dev 2014;5:22-5. Giri P, Baviskar M, Phalke D. Study of sleep habits and sleep problems among medical students of Pravara Institute of Medical Sciences, Loni, Western Maharashtra, India. Ann Med Health Sci Res 2013;3:51-4. Baste VS, Gadkari JV. Study of stress, self-esteem and depression in medical students and effect of music on perceived stress. Indian J Physiol Pharmacol 2014;58:298-301. David MA, Hashmi SS. Study to evaluate prevalence of depression, sleep wake pattern and their relation with use of social networking sites among first year medical students. Int J Pharma Med Biol Sci 2013;2:27-31. Devi K, Rohan P, Ashok M. Study of psychological depression and its associated factors among medical students in Pondicherry. Indian J Basic Appl Med Res 2013;2:1009-16. Gupta S, Basak P. Depression and type D personality among undergraduate medical students. Indian J Psychiatry 2013;55:287-9. Iqbal S, Gupta S, Venkatarao E. Stress, anxiety and depression among medical undergraduate students and their socio-demographic correlates. Indian J Med Res 2015;141:354-7. Kumar GS, Jain A, Hegde S. Prevalence of depression and its associated factors using beck depression inventory among students of a medical college in Karnataka. Indian J Psychiatry 2012;54:223-6. Manjunath R, Kulkarni P. Mental health status and depression among medical students in Mysore, Karnataka. Depression 2013;4:50-3. Modi K, Kumar D. Anxiety and depression in medical students and its association with coping method adopted by them. Indian J Res Rep Med Sci 2013;3:20-2. Prakash J, Prabhu HA. A study of depression among medical students of private medical college in South India. J Evol Med Dent Sci 2014;3:3856-62. Sahu P, Inamdar I, Ubaidulla M, Tambe S. Study of depression among medical students of different pathies in Nanded City, Maharashtra. J Evol Med Den 2013;2:3978-86. Sarkar J, Gupta P, Manna N, Saren AB, Chattopadhyay S, Mundle M. Depressive symptoms among undergraduate Medical students: Study from a Medical college in Kolkata, India. J Dent Med Sci 2013;4:13-8. Sidana S, Kishore J, Ghosh V, Gulati D, Jiloha R, Anand T, et al. Prevalence of depression in students of a medical college in New Delhi: A cross-sectional study. Australas Med J 2012;5:247-50. Singh A, Lal A, Shekhar A. Prevalence of depression among medical students of a private medical college in India. Online J Health Allied Sci 2010;9:1-6. Vankar JR, Prabhakaran A, Sharma H. Depression and stigma in medical students at a private medical college. Indian J Psychol Med 2014;36:246-54. Venkatesh PD, Badesaab B, Kumar A, Patil R. A study on the prevalence of depression among adolescent medical students, SS institute of medical sciences and research centre, Davangere, Karnataka. Indian J Public Health Res Dev 2014;5:244-7. Verma S, Mishra A, Kumar S, Dixit V. Could academic performance be a tool for screening depression: A cross-sectional study among 1st year medical students? Int J Pharm Bio Sci 2013;4:749-56. Bassi R, Sharma S, Kaur M. A study of correlation of anxiety levels with body mass index in new MBBS students. Natl J Physiol Pharm Pharmacol 2014;4:208-12. Pahwa B, Goyal S, Srivastava K, Saldanha D, Bhattacharya D. A study of exam related anxiety amongst medical students. Ind Psychiatry J 2008;17:46-8. Amritha K, Srikanth S, Srivatsa V, Thirunaaukarasu, Susiganeshkumar E. Stressful life events- Effect on mental health of medical students. Indian J Med Spec 2013;4:254-8. Srivastava K, Raju M, Saldanha D, Chaudhury S, Basannar D, Pawar AA, et al. Psychological well-being of medical students. Med J Armed Forces India 2007;63:137-40. Abraham RR, Zulkifli EM, Fan ES, Xin GN, Lim JT. A report on stress among first year students in an Indian medical school. Southeast Asian J Med Educ 2009;3:78-81. Behere SP, Yadav R, Behere PB. A comparative study of stress among students of medicine, engineering, and nursing. Indian J Psychol Med 2011;33:145-8. Brahmbhatt K, Nadeera V, Prasanna K, Jayram S. Perceived stress and sources of stress among medical undergraduates in a private Medical College in Mangalore, India. Int J Biomed Adv Res 2013;4:128-36. Chatterjee C, Mandal P, Mallik S, Manna N, Sardar J, Dasgupta S. A study on mental distress among MBBS students in a Medical College, Kolkata, India. Ann Trop Med Public Health 2012;5:453-7. Das P, Basu M, Dasgupta U, Roy B, Das PK, Mundle M. Health related quality of life among undergraduate medical students of Kolkata. Healthline 2013;4:56-63. Deepali A, Shobha MV, Reddy PS. A study of mobile phone usage on sleep and stress among first year medical students. Res J Pharm Biol Chem Sci 2015;6:720-3. Gupta S, Choudhury S, Das M, Mondol A, Pradhan R. Factors causing stress among students of a medical college in Kolkata, India. Educ Health (Abingdon) 2015;28:92-5. Khaliq F, Gupta K, Singh P. Stress, autonomic reactivity and blood pressure among undergraduate medical students. JNMA J Nepal Med Assoc 2010;49:14-8. Kittu D, Patil R. Study of association of psychological stress and depression among undergraduate medical students in Pondicherry. Nat J Community Med 2013;4:555-8. Konjengbam S, Laishram J, Singh BA, Elangbam V. Psychological morbidity among undergraduate medical students. Indian J Public Health 2015;59:65-6. Madhyastha S, Latha KS, Kamath A. Stress, Coping and gender differences in third year medical students. J Health Manag 2014;16:315-26. Mahawar P, Phadnis S, Ghosh G, Kataria O, Dixit S. Psychological morbidity in students of medical college and science and art college students – A comparative study. Online J Health Allied Sci 2011;10:3-4. Mannapur B, Dorle A, Hiremath L, Ghattargi C. A study of Psychological stress in undergraduate Medical Students at SN Medical College, Bagalkot, Karnataka. J Clin Diagn Res 2010;4:2869-74. Mehta K, Kaur S, Girgla KK, Kaur P, Kaur H. A study of mental distress in medical students. Natl J Physiol Pharm Pharmacol 2015;5:190-4. Nair SS, Chethana KV, Raghunath P. Perceived stress among medical undergraduates in a private medical college in Raichur, India. Int J Recent Sci Res 2013;4:428-31. Nandi M, Hazra A, Sarkar S, Mondal R, Ghosal MK. Stress and its risk factors in medical students: An observational study from a medical college in India. Indian J Med Sci 2012;66:1-2. Reang T, Bhattacharjya H. A study to assess the emotional disorders with special reference to stress of medical students of Agartala government medical college and Govinda Ballabh Pant Hospital. Indian J Community Med 2013;38:207-11. Saxena Y, Shrivastava A, Singhi P. Gender correlation of stress levels and sources of stress among first year students in a medical college. Indian J Physiol Pharmacol 2014;58:147-51. Sharma B, Wavare R, Deshpande A, Nigam R, Chandorkar R. A study of academic stress and its effect on vital parameters in final year medical students at SAIMS Medical College, Indore, Madhya Pradesh. Biomed Res 2011;22:361-5. Sivan S, Rangasubhe P. Prevalence of stress and its associated factors. J Evol Med Dent Sci 2013;2:9386-94. Solanky P, Desai B, Kavishwar A, Kantharia SL. Study of psychological stress among undergraduate medical students of government medical college, Surat. Int J Med Sci Public Health 2012;1:38-42. Srinivasan K, Vaz M, Sucharita S. A study of stress and autonomic nervous function in first year undergraduate medical students. Indian J Physiol Pharmacol 2006;50:257-64. Supe AN. A study of stress in medical students at Seth G.S. Medical college. J Postgrad Med 1998;44:1-6. Waghachavare VB, Dhumale GB, Kadam YR, Gore AD. A study of stress among students of professional colleges from an urban area in India. Sultan Qaboos Univ Med J 2013;13:429-36. Fink G. Stress Science: Neuroendocrinology. Cambridge, Massachusetts, United States: Academic Press;2010. Del Giudice M, Ellis BJ, Shirtcliff EA. The adaptive calibration model of stress responsivity. Neurosci Biobehav Rev 2011;35:1562-92. Lloyd C, Gartrell NK. Psychiatric symptoms in medical students. Compr Psychiatry 1984;25:552-65. Bassols AM, Okabayashi LS, Silva AB, Carneiro BB, Feijó F, Guimarães GC, et al. First- and last-year medical students: Is there a difference in the prevalence and intensity of anxiety and depressive symptoms? Rev Bras Psiquiatr 2014;36:233-40. Kessler RC, Berglund P, Demler O, Jin R, Merikangas KR, Walters EE, et al. Lifetime prevalence and age-of-onset distributions of DSM-IV disorders in the national comorbidity survey replication. Arch Gen Psychiatry 2005;62:593-602. Brady KT, Grice DE, Dustan L, Randall C. Gender differences in substance use disorders. Am J Psychiatry 1993;150:1707-11. Menon V, Sarkar S, Kumar S. Barriers to healthcare seeking among medical students: A cross sectional study from South India. Postgrad Med J 2015;91:477-82.